Mommy Lessons 101: On the second day of Christmas: Free Emails, Videos, Letters and Text Chats from Santa! On the second day of Christmas: Free Emails, Videos, Letters and Text Chats from Santa! One of the most magical childhood moments I witnessed was when my kids got an email video from Santa. The response was so sweet and full of childhood innocence. 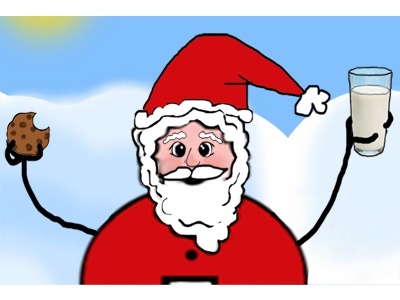 The website we get our videos from each year is http://www.portablenorthpole.com/ where messages are completely personalized with pictures, specific gift requests and personal details and the best thing is it is free! Have fun seeing the magic I do each year when my kids receive these messages. Another cute site is http://www.freelettersfromsantaclaus.com/ where letters are personalized and available to print right from home! And one more up to date communication with Santa is Santa Talk ( http://mysantatalk.contentai.com/) where you can "chat" or rather text back and forth with Santa from your home computer or mobile devices. This is pretty creative and quite impressive how the responses are. And finally, you can give back yourself by having your kids write to Santa. Drop off letters to Santa at any Macy's store by depositing them in special designated Santa Mail Letterboxes. For each letter received, Macy's will donate $1 to Make-A-Wish, up to $1 million. How cool to know where to drop those Santa letters off to!